Archive by category "Laser Tattoo Removal"
Ever think of getting rid of a regrettable tattoo? Just couldn’t stand the look of it anymore? Well imagine feeling that tattoo was causing negative energy. That is supposedly how actress Megan Fox felt about a Marilyn Monroe tattoo she had on her forearm. She felt so strongly about it, that she had laser tattoo removal to get rid of it. In an interview with an Italian magazine, she said she had it done because, “[Marilyn Monroe] is a negative character, as she suffered from personality disorders and was bipolar. I do not want to attract this kind of negative energy in my life.” Monroe infamously passed away from a drug overdose in 1962 at only 36 years old. 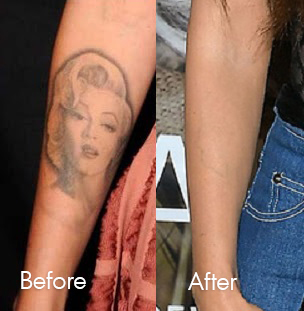 Megan Fox’s tattoo back in 2011 (Left) & most recently in 2019 (Right). About 50 million Americans have tattoos – including about 40% of adults between ages 26 and 40. Tattoos have been a part of mainstream culture for several decades, and are popular among virtually everyone. However, the rates of tattoo regret are significant, with about 1 in 4 people wishing they could remove their ink. For people wanting to remove their unwanted tattoos, laser tattoo removal is the only effective method that doesn’t cause scarring. Laser tattoo removal has been growing in demand alongside tattoo trends, and the technology has greatly improved over the past 20 years. The Neiman Dermatology Building has always been at the forefront of bringing the best in laser treatments and skincare to patients in Buffalo. 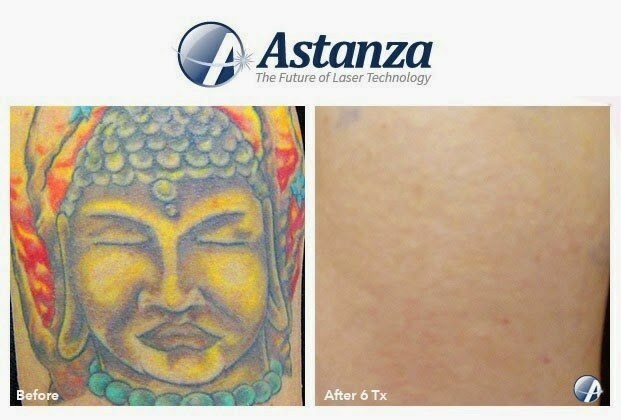 The Astanza Trinity is the world’s most powerful multi-wavelength system for tattoo removal – which means it can remove the full spectrum of ink colors faster than any other laser. Traditional laser tattoo removal systems have weaknesses, and are not able to remove stubborn ink colors such as green, blue, red, or resistant black. The Trinity is the first system of its kind to combine high levels of peak power (for better destruction of ink) with three full-powered laser wavelengths, each of which targets a portion of the color spectrum. This combination of high power and wavelength versatility allows our staff at the Neiman Dermatology Building to remove colorful tattoos better than anyone else in Western New York. Laser tattoo removal works by sending light energy into the dermal layer of the skin where tattoo ink particles are trapped. As the laser light penetrates the skin, the ink particles absorb the light and instantly shatter. The tattoo is visibly lightened as the body’s lymphatic system removes the destroyed ink particles following the treatment. Due to the fact that the Trinity system at the Neiman Dermatology Building provides a higher peak of power with each pulse, more ink is shattered with each treatment session with less trauma to the surrounding skin. Patients treated with the Trinity see their tattoo vanish in fewer sessions. Trinity tattoo removal treatments are a great option for patients with resistant ink colors that have not been able to be completely removed by other lasers. The experts at the Neiman Dermatology Building can assess your tattoo and decide the right course of treatment based on your unique skin tone and tattoo ink colors to give you the fastest removal results possible. The Neiman Dermatology Building provides free consultations to patients considering laser tattoo removal. To schedule yours or learn more, call 716-688-0020 today.